Marinella Beach in Castelvetrano is known as one of the most beautiful beaches near Trapani. Just a step away from the archaeological remains in Selinunte, it is a long stretch of golden sand. The sea is clean and light blue, and it is occasionally windy. Macari Beach in San Vito lo Capo is a small, picturesque bay nestling between the Zingaro Nature Reserve and the Monte Cofano Reserve. 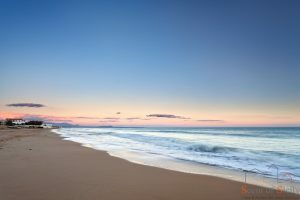 It is the main beach in this very popular seaside area, and it offers all the structures necessary to relax under the sun: cafés, restaurants, and water and beach sports. The beach is beautiful and long, the sea is turquoise and clear. On the seaside in the city of Trapani you will find the incredible San Giuliano Beach, famous for its clean, crystal clear water. It is two kilometers long and the sand is very fine and light colored. Cala dei Turchi is a beautiful beach of sand and rock, one of Sicily’s most picturesque sites. Porta Botteghelle is one of Trapani’s city beaches, right under the Tramontana walls. It is perfect for families with children. Cala Beretta is a small beach in the evocative setting of the Nature Reserve. An unblemished natural environment and a truly picturesque atmosphere. The breathtaking view makes Scopello one of the most beautiful beaches in Trapani and Sicily. Punta Tramontana is part of a protected lagoon area. It is perfect for nature lovers in search of peace and quiet. It is near Marsala and is a beach of white sand and turquoise water. Tonnara del Secco is a beach in the Firriato Gulf, a stretch of solitary and unblemished coastline with beautiful blue water. Capo Feto, near Mazara del Vallo, has a long beach and overlooks a crystal clear sea, ideal for long swims. It is part of a protected area of Mediterranean scrub and marshes, one of the last marshlands in Sicily, 453 hectares of sandy dunes and small pools.